Heavy duty, ergonomic, leather faced executive chair. Designed for the larger user, the Rocky IV Goliath is rated up to 27 stone (378 lbs; 171 kg). Featuring gas powered height adjustment, locking reclining function with adjustable tension control, and soft, padded armrests. This Chair is the ultimate in comfort, And the gas lift fitted will not let you down unlike lesser weaker models. If you can collect the chair and have a vehicle big enough we can pre build it for you at no extar cost, but this service is for collection only. Please note someone must be at address to sign for and receive your Chair. Dimensions: Seat Width: 59cm / 23. Seat Height: 49 to 56cm / 19" to 22". Seat Depth: 51cm / 20. Back Height: 68cm / 27" Back Width: 57cm / 22". Arm Width: 80cm / 32. Weight: OF PACKAGE (57lbs; 26 kg). Rated up to 27st (378 lbs; 170 kg). 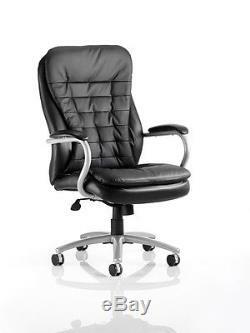 The item "Heavy Duty Leather Executive Computer Swivel Office Chair 27 Stone Goliath 170kg" is in sale since Wednesday, August 24, 2016. This item is in the category "Business, Office & Industrial\Office Equipment & Supplies\Office Furniture\Office Chairs". The seller is "pcmediaman" and is located in Nottinghamshire. This item can be shipped to United Kingdom.